Everyone around him is in agreement: the Palace Malice that is in Aiken this winter is bigger, stronger and tougher than the colt that was here last year. He’s a 4-year-old with bragging rights, having won such races as the Belmont Stakes and Metropolitan Mile. If he were Rocky Balboa he would be throwing his arms up at the top of those famed steps in Philadelphia. His arena of choice is the Aiken Training Track. The colt returned to Aiken on November 14, after a veterinary exam showed no signs of the bone bruise that had called an end to his 4-yearold campaign. Now owned by a partnership of Dogwood Stable and Three Chimneys Farm, Palace Malice will train in Aiken until mid- January and then be shipped to his trainer, Todd Pletcher, at Palm Beach Downs in Florida. Cot Campbell, the president of Dogwood, is out most mornings to watch the stable’s star train and is quick to express his delight that Palace Malice is back in town. Training is what Palace Malice likes to do and he lets his team know it. 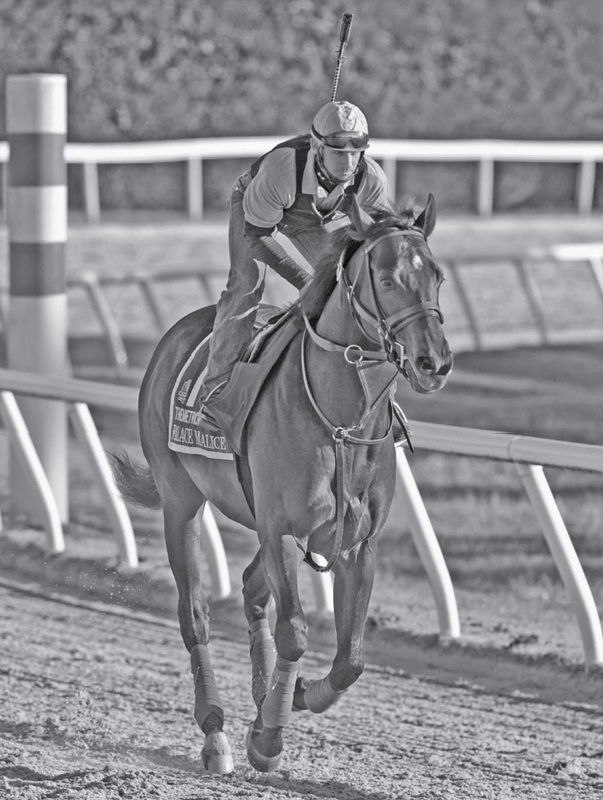 When he first arrived in Aiken, his trainer Brad Stauffer had him simply walk a few times around the shedrow. The colt had been off for 60 days, so he had to be started slowly. At least that was the plan. Palace Malice was having none of it. So off he went to the track with his exercise rider Gene Tucker, accompanied by both Stauffer and Ron Stevens on ponies. The idea was to have several days of jogging and then eventually work up to a steady gallop. Once again, the colt had other ideas. On one drizzly, cold November morning, Palace Malice reared, unseated his rider and headed off down the track at a gallop. Dogwood’s vice president, Jack Sadler slipped in the mud, losing his boots, glasses and hat as he tried to catch him. The sight of the vice-president on his belly on the track gave pause to Palace Malice’s run, and the colt walked up to Jack and stopped. Catastrophe averted. Palace Malice goes to the track each morning at 8:30, jogs a turn around the oval and then gallops five-eighths of a mile. In the afternoons around 1:30 he is brought out of his stall for a walk, and if there is an audience he will throw his head up and pose when he hears the click of a camera. Horses are creatures of habit, so the team at Legacy Stable has tried to make Palace Malice’s routine as much like last year’s as possible. He has the same stall, the same groom (Daniel Negrete) and the same rider. He is definitely “The Horse” around the barn and the track. 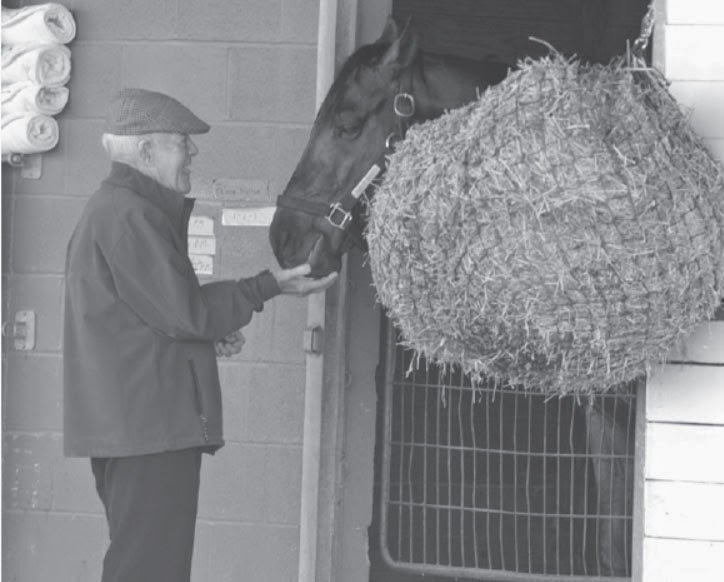 “If he is walking back to the barn and a set of horses is jogging towards us he puffs himself up and thinks about doing something,” said Tucker. Fortunately, Palace Malice has not acted on his impulses. Dogwood and Three Chimneys Farm have released the names of the five races on Palace Malice’s schedule for 2015, beginning with the Westchester Handicap in May and culminating with the Breeders’ Cup at the end of October, which will be held for the first time at Keeneland Race Course in Lexington, Kentucky. Between these bookend races are the Metropolitan Mile, the Whitney and the Jockey Club Gold Cup. The opportunity for Palace Malice to win back-to-back runnings of the Westchester and Metropolitan Handicap would place him in rarified company and further enhance his already impressive record. Palace Malice has purse earnings of $2,676,135 as he heads into 2015 and his fourth year of racing. Upon completion of his racing career he will stand at stud at Three Chimneys Farm.